Despite appearances, and the evidence in this blog, I don’t actually buy a lot of gadgets. At least, not until a current one needs replacing. I have one computer (second hand), one tablet (3 years old) and one smartphone (second hand). Even only one TV (2008) in the house. This isn’t because I’ve mastered willpower. My job and tech blogging put enough gadgets in front of me to keep me more than amused - I simply can’t justify buying anything else. Except that is, when it comes to keyboards. I seem to have no problem justifying more of those. I don’t know what it is exactly. This blog is an enactment of my dream ‘tech journalist’ life, where I would travel the world seeing the future of gadgets and writing about them on the move. The keyboards are part of a never-ending quest to have a mobile device from which I can comfortably write wherever and whenever the moment takes me. When I started the blog, it was the iPad that seemed to represent the best portable writer. Smaller and lighter than my laptop, with amazing battery life and a screen comfortable enough to do simple word processing on, I went out and bought a Logitech wireless Bluetooth keyboard. Close to laptop keyboard size, the case doubled as a stand and I could type as fast as I do at my computer. It was great. But it’s not massively portable and I have to remember to have it on me. Next up was the Zagg Profolio Plus keyboard. This wrapped the iPad up completely and turned it into a tiny laptop. Backlit keys and always present with the tablet meant strong portability, but over time, I missed having the iPad as, well, a tablet. The Brydge+ turns an iPad into a MacBook Pro style device - a great keyboard! Brydge make a lovely iPad keyboard, essentially turning it into a miniature MacBook. This is still my go-to keyboard for the iPad, as it’s very easy to un-dock when I want my tablet back in hand – but then it was the iPad’s turn to feel a little less portable. Smartphones have gotten bigger and more powerful. My Samsung Note 3, running a custom ROM is so fast, I’ll often pick it up ahead of the iPad 3, both at home and out and about. With a 5.7” screen, it’s small enough to be comfortable in my pocket, yet big enough to do some light document editing and draft the odd blog post – wherever I happen to be. A step closer to the dream? Maybe. Definitely justifies a new keyboard! So what did I buy this time? I bought this. Folding keyboards came of age in the late nineties and early noughties when Palm PDAs were all the range. The folding keyboards that you could buy for those were great, but very expensive. They weren’t even wireless. This Bluetooth one set me back only £15 and it’s great! It will fit in your trouser pocket, but chunky girth and sharp corners won’t flatter your look. But it’s easily lost in a coat pocket or a bag and it’s very light indeed. A tick in the portability box! Once it's been through the initial Bluetooth pairing process with your phone (a simple press of ‘Fn’ and ‘C’ will sort that out) and opening the keyboard out switches it on and connects it to the phone within a couple of seconds. It’s well made for such a cheap keyboard. The outer case is aluminium and the hinges fold the keyboard out completely flat. Try and bend it and it probably will, but that's true of some much more expensive gadgets too! Keys are a good size with decent response and travel. Bluetooth connects almost immediately. A lot of folding keyboards at this end of the market fold down the middle, which often results in an ugly and uncomfortable split spacebar – this keyboard looks solid and complete with the two ‘seams’ barely visible. It’s not perfect and this is definitely not a solution for writing on your lap. There is nothing to hold the hinges in the open position. Rather it’s designed to be stable on a flat surface like a table top. Four small rubber feet keep it from slipping around and the keys are a good size with decent travel. If you’re used to laptop keyboards, you’ll adjust to this in no time. The only real compromise that’s been made is that the outer keys, if pressed hard, can cause the keyboard to lift up, as there are no feet directly outside the farthest edges. I’m thrilled with it. There are media keys as second functions across the top row and a home key gets you back to your gadget’s main menu if you want to switch between apps. There are even ‘cut’, ‘copy’ and ‘paste’ keys which really help speed up the document editing, without having to reach out to the touch-screen. The keys themselves are well sized and spaced and have a decent amount of travel although I must admit, whilst I was adjusting to the keyboard, I did wish the backspace key were a little larger. Whist I doubt that I’ll be writing every blog post this way and I highly doubt this will be the last keyboard I buy (that’s an everlasting crusade). I can recommend this folding keyboard as the one to keep in your bag at all times. 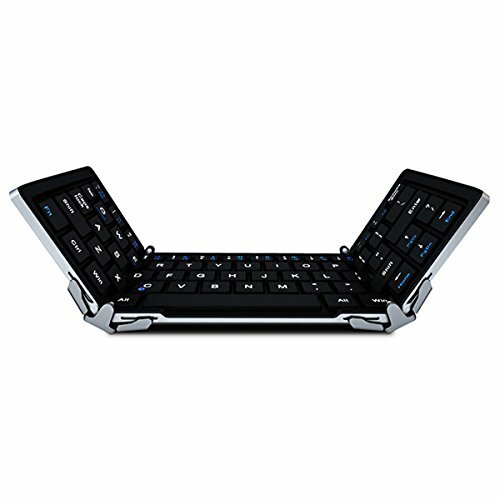 The EC Technology Folding Keyboard is cheap, light and portable. Even if you don’t fancy getting productive with your documents on the move, you’ll easily be able to keep up with WhatsApp and Facebook conversations instead. And nearly as fast as you would on your laptop!